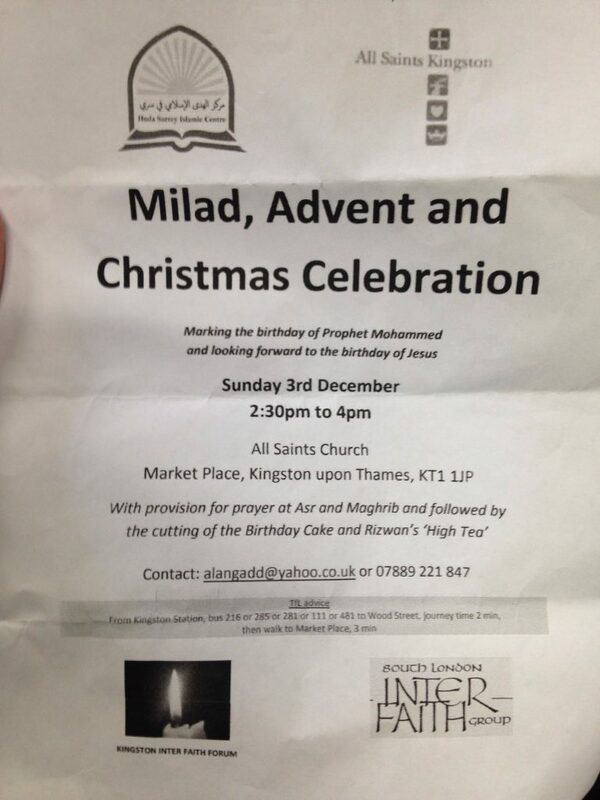 But note how this event is “Marking the birthday of Prophet Mohammed”, but not looking forward to the birthday of the Lord Jesus Christ, the Son of God. Mohammed gets his prophethood, while Jesus gets neither his prophethood nor his priesthood; neither his kingship nor his messiahship. 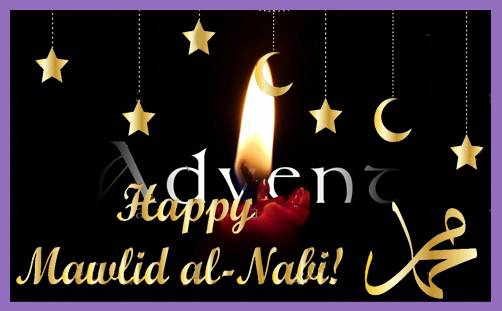 It’s the exalted Prophet Mohammed along with plain old Jesus, because to have added any of his claims to divinity would, of course, have alienated many Muslims (if they hadn’t already been alienated by the haram celebration), which wouldn’t have been very interfaith or sensitively missional, would it? And then, of course, there was the act of divine worship in St Mary’s Cathedral, Glasgow, in which it was declared publicly from the Qur’an that God can have no sons, and so the Gospel writers were engaged in a blasphemous deceit. Every time a church accords Mohammed the epithet ‘Prophet’, they are rejecting the crucifixion, denying the resurrection of Christ, and refuting that the Word was made flesh and dwelt among us, for Mohammed denied all of these foundational tenets of the Christian faith. The Jesus he espoused is the plain old one – no more than a prophet, and certainly an inferior one to him. Say, “We have believed in Allah and in what was revealed to us and what was revealed to Abraham, Ishmael, Isaac, Jacob, and the Descendants, and in what was given to Moses and Jesus and to the prophets from their Lord. We make no distinction between any of them, and we are Muslims (submitting) to Him (Âl ‘Imran 3:84). And (for) their saying, “Indeed, we have killed the Messiah, Jesus, the son of Mary, the messenger of Allah .” And they did not kill him, nor did they crucify him; but (another) was made to resemble him to them. And indeed, those who differ over it are in doubt about it. They have no knowledge of it except the following of assumption. And they did not kill him, for certain (An-Nisa’ 4:157). Rather, Allah raised him to Himself. And ever is Allah Exalted in Might and Wise (An-Nisa’ 4:158). All of which makes Mohammed a false prophet (Jer 14:14-16; 1Jn 4:1; Acts 4:12; 2Cor 11:3f), but to say that isn’t very interfaith or sensitively missional, is it? You may dismiss all of these expository concerns as gratuitously contentious and divisive: the Kingston Interfaith Forum is simply being neighbourly and hospitable, isn’t it? It is doing good work, isn’t it? There are many sincere Christians across all denominations who take a Universalist approach to salvation, or for whom the Incarnation is a myth, preferring instead the conception of a ‘universal Christ’. These may force questions about the historical Jesus – that Christ, eternal and universal, has been incarnated in Jesus of Nazareth – but some Christians believe quite simply that such an incarnation has not taken place solely, finally, definitively and normatively in Jesus; that his Lordship can appear in innumerable forms, and that all religions recognise Christ in one way or another. For many of them, historical inconsistencies or soteriological contradictions present no problem, principally because so many in the modern world no longer regard such questions as being of the essence of their faith, or they accept that we lack sufficient historical evidence definitively to settle most of them. By accepting a down-grading of the historical Jesus, certain inescapable soteriological problems conveniently become escapable. We can reconcile the Noble Eightfold Path of Buddhism with the Five Pillars of Islam; and release from samsara in Hinduism becomes an expression of justification by faith alone in Protestant Evangelicalism. You may quibble over the radical redefinition of their essential claims, or the denial of central propositions, or the barefaced deception of warped and contrived compatibility. But it is a socio-soteriological fact that for a great many people in the world today, the Adonai of Judaism, the Jesus of Christianity, the Dharmakaya of Mahayana Buddhism and the Prophethood of Mohammed, although phenomenologically different, may nevertheless all stand in their own soteriological alignment with the the Divine. Blessed are the syncretisers, for they shall be called the children of God.